The charity partners volunteers with athletes who have special needs on the baseball field. CHEROKEE COUNTY, Ga. -- A charity that helps children and job adults with disabilities fought with Facebook for weeks as they tried to get an job advertisement approved and posted. 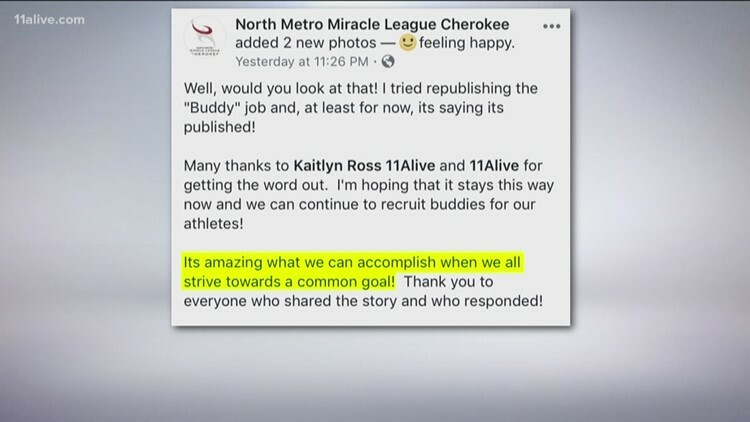 The job ad for the North Metro Miracle League featured a picture of a young boy in a wheelchair hitting a baseball off a tee and read in part "We are in need of compassionate and energetic people willing to be buddies for our athletes which span from the age of 2 to 50+. If you have a heart for volunteering and helping others we can guarantee that you will find your place at North Miracle League Cherokee." Facebook denied the job ad looking for volunteers calling it “discriminatory.” Rick Davies, who runs the organization, appealed several times but Facebook dug their heels in and wouldn’t be specific about which parts of the job ad were discriminatory. Davies spoke to 11Alive’s Kaitlyn Ross on Jan. 21 and said the entire situation is frustrating because the volunteer-run organization depends on securing volunteers to help the athletes enjoy the baseball field. "It's frustrating and it's disheartening," he said. "All of the language we use is positive, it's reinforcing the values we believe in. And I cannot see anything that would cause an AI algorithm to flag it as discriminatory." Kaitlyn Ross reached out to Facebook asking why the job ad was denied. While she didn’t receive a response, shortly after the piece aired on 11Alive News, Davies tried to publish the job ad again and it worked. Here is the job posting. He posted on Facebook, “Well, would you look at that! I tried republishing the "Buddy" job and, at least for now, its saying its published! To learn more and get involved, visit North Metro Cherokee on Facebook or sign up to volunteer on their website.